04. What Kind of Animal Are You? “Constant Shallowness Leads to Evil” phase. John announces “Amethyst Deceivers” by thanking the audience and saying the song’s name. John announces “Constant Shallowness Leads to Evil” with “We’ve heard that some of you may have read that we eat human flesh. We only do this on religious holidays. We don’t eat girls, and we don’t eat gold. We only drink silver. We only drink silver liquids. We only drink silver liquids! We like mushrooms, we like drugs, and we like cheese! We are d-decadent and we are symmetrical. We are decadent and we are symmetrical! We are decadent and we are symmetrical.” Apparently this was a reference/caustic joke to actual news articles (Russian ones, I believe) that erroneously claimed that Coil were cannibals. 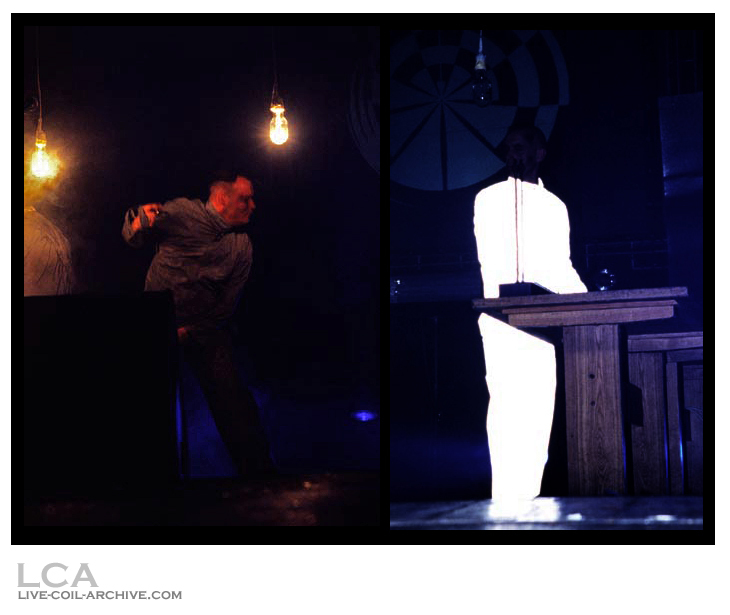 There were false rumors at the time that Coil would play at the Teatro Duse, Bologna, Italy on September 28th. 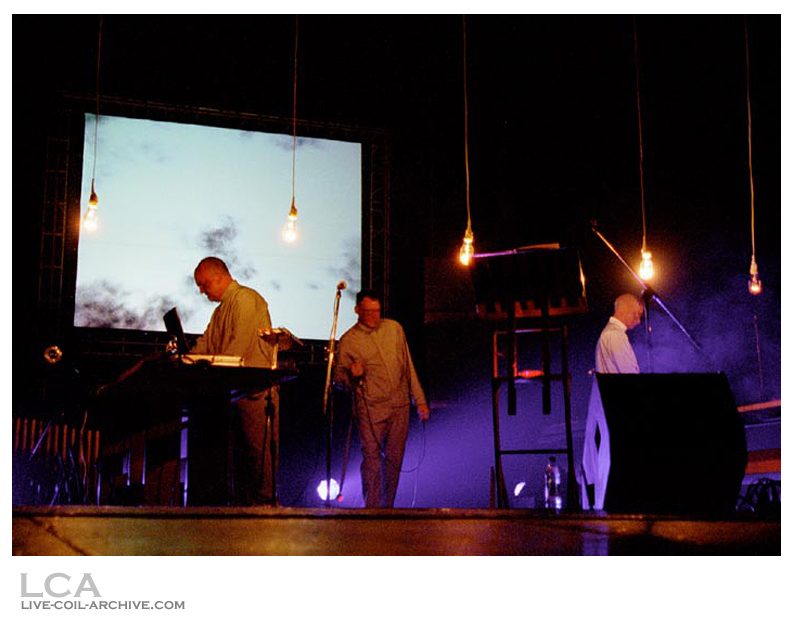 Interesting to note that in 2001, Coil planned three projects that sadly never came to be. The first was a studio album of live material up to that point – no real details are known, but I assume the idea was to record all the tracks that were exclusively live at the time. 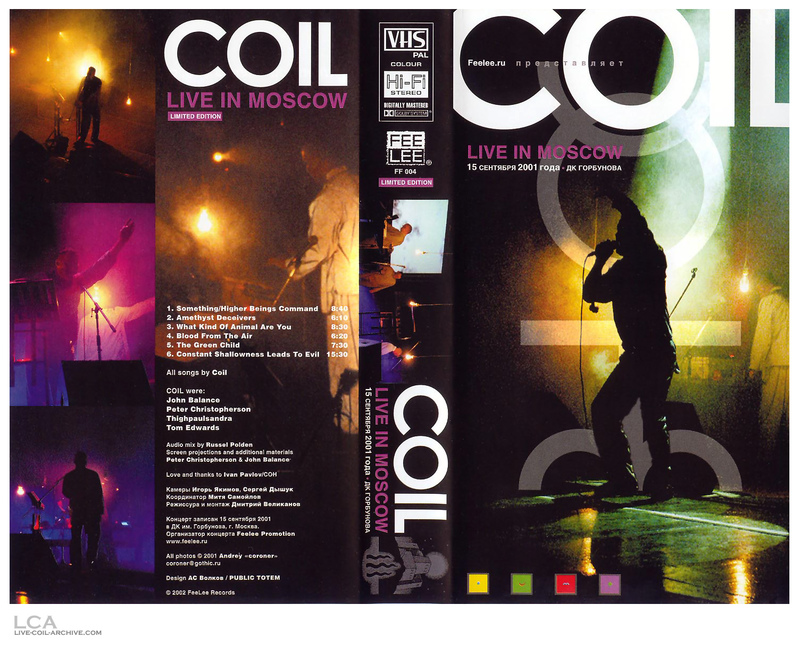 The second was a DVD (or DVD boxset) containing the Royal Festival Hall (2000-09-19), Amsterdam (2001-06-01), Irving Plaza (2001-08-18), and Moscow (this one) shows. The third, mentioned as “still forthcoming” on the Coil news page on December 14, 2001, was a pair of DVD releases, although it wasn’t mentioned what these would have entailed, exactly. John Balance – vocoder/vocalizer on “Amethyst Deceivers,” harmonizer on “I Am the Green Child,” metal sheet percussion on “Constant Shallowness Leads to Evil”. 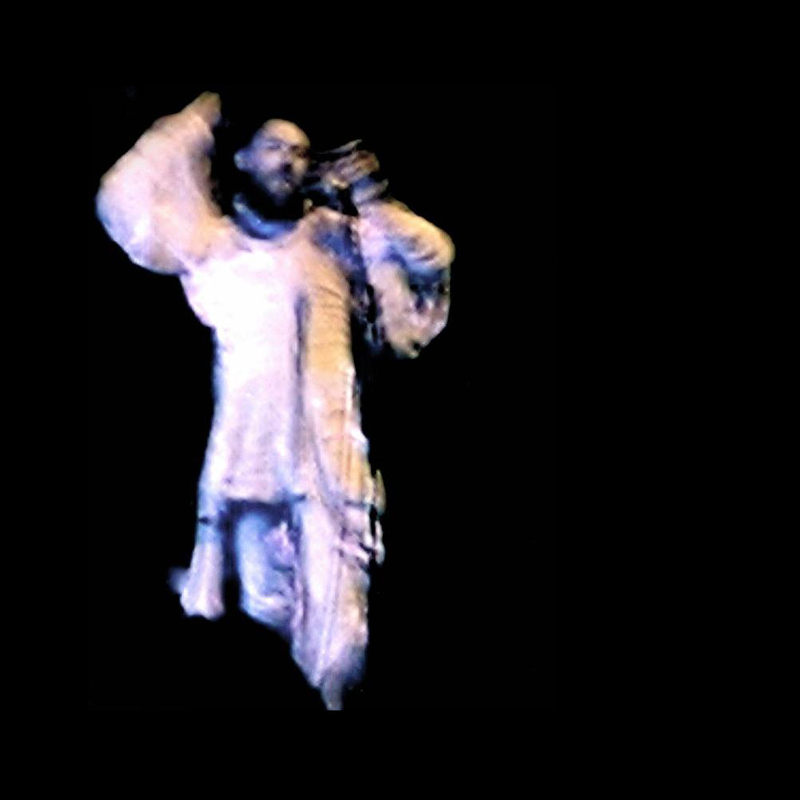 Peter “Sleazy” Christopherson – synths, backing vocals on “Blood from the Air”. Thighpaulsandra – Moog Theremin (possibly incorporated at other shows as well). Russell Polden – live engineer. According to Danny McKernan, the only reason Ossian Brown didn’t play at this show or the previous one in New York was because he had problems obtaining a visa. COIL CAN YOU HEAR ME, BANDERLOGY? The first thing that struck the COIL concert is the rare “hit in the suit”: the absolute match of the hall size, the composition of the audience and the quality of the sound that took place on the stage. There were no accidental people. The sound was perfectly built. The light (from a series of small lamps on long cords to a powerful backlight from the back, unmercifully invading a sound-cut brain) was, like sound, directed by a brilliant maniac. The hall was filled exactly enough so that everyone could sit comfortably and had to cuddle when taking off. But there were no vacant seats. 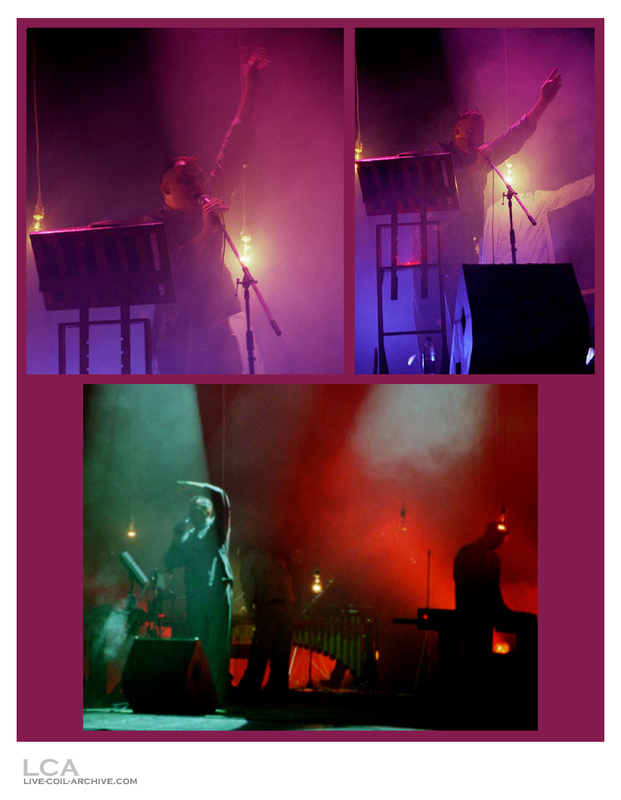 It seems that the recipe for the concert was calculated on very accurate (alchemical – alchemistic) scales. All succeeded. It all began. On the stage – people in robes, borrowed either from Orwell, or in a colony of strict regime. On their faces – a monstrous make-up: bruises, abrasions, bruises. On different parts of the body, sewn small, pulsating red lanterns. Three strange people conjure, bending over the tables, on which there is a little electronic equipment. They are like surgeons. Doctors are murderers. Another person whispers, utters, screams, conjures, moving in an uneven epileptic rhythm, flapping a red flashlight on a leash. The sound is sharp, then tender and resilient, like a huge ball, then dying out like an echo. Sound, then flowing like a liquefied gas, then beating like a hammer. It’s dangerous to look at the stage. On the stage is a screen. On the screen – hypnospiral. The insinuating voice and the swaying rhythm somehow slowly tightens, and after a few minutes you are already sitting, chained to the constantly changing contrast pattern. The sound is getting tougher, looking away from the ever-changing spiral (lightning discharges, flashing glares, circles on the water, targets drawn right in your head) is no longer possible. You’re caught. Sounds : – Thank you! That was incredible! What did you do to us? Christofferson : – We played you a little. Sounds : – How did you like the audience and the concert in general? Christofferson : – Very cool, we liked it. There was a great sound. We in Moscow will be delayed for another day, we hope to consider it better. Sounds : – And how did you spend the previous day? Balance : – In the shower. And a little walk. Christopherson : – We are going to take a walk in the Red Square tomorrow morning. Balance: – No, we never play an encore at all. Because we prefer to say everything in the program. Better we’ll finish what we did not finish at the next concert. Sounds : – Yeah, so you’re planning to return? Christofferson : – Yes, most likely. Next year. Сергей Некрасов attended this gig and remembers: “Two gigs COIL did in MOSCOW – at DK GORBUNOVA (well documented by now in different formats – from VHS to vinyl bootleg to official CD) and at TOCHKA clubs. 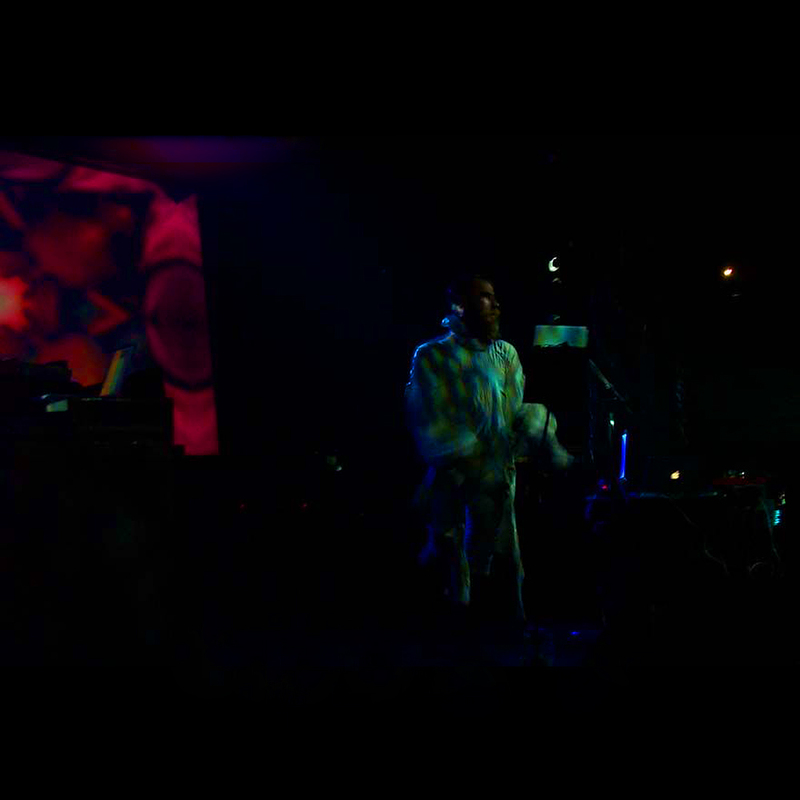 I think both times the opening set was done by COH (well, first time for sure), and then COIL had their time. The ticket to the first gig, I remember, had a price of 666 roubles, which raised some hell among localreligious bigots. Also, the first Russian edition of GOLDEN HAIR and VOICE OF SILVER were both released on CDs in commemoration of the first COIL visit to Russia and were officially sold there (at DK GORBUNOVA). Each CD had one exclusive (by that time) track – AYOR and COLD CELL. All sources except AMT – MTV Russia. SBD #1a 9/10 No 55 min M1, FLAC There is possibly an internal cut on "What Kind of Animal Are You?" but it's hard to tell, given Thighpauslsandra's theremin overdrives the audio around then. Some audience applause after "Blood from the Air" is edited out. Officially released on Live Two and used on Colour Sound Oblivion DVD #4. SBD #1b 9-/10 Yes 55 min M1 (? ), 251kbps AAC EDIT #2 audio. Has a different mix than SBD #1a, i.e. greater focus on the left channel and different stereo-balancing. On "I Am the Green Child," John's normal and affected vocals are mixed between each channel a little more. AMT 8+/10 No 9 min M1, MKV Vacation footage of John and Peter in Moscow, plus soundcheck/pre-show backstage footage. Officially released as Colour Sound Oblivion DVD #4. EDIT #1 6/10 No 86 min M?, 768 x 576 MP4 2-cameras (professional). Uses SBD audio. Inter-cut with exclusive interviews with the band (overdubbed in Russian) onstage before the gig and footage from Beata’s Favorite Videos, where she interviewed John and Peter about their favorite music videos and musical influences. Broadcast on MTV Russia in abridged, non-chronological form as two separate programs. EDIT #2 9-/10 Yes 55 min M1 (? ), 718 x 574 M4V 2-cameras (professional). Uses SBD #1b. Originally released on the Live in Moscow 2001 VHS tape, but rereleased on Itunes in high fidelity by Feelee Records in 2015. EDIT #3 9/10 Yes 55 min M1, MKV 2-cameras (professional). Notable for its orange visual tone, distinguishing it from other video sources. Uses "Live Two" audio - where there are edits in the audio, the video is edited around them. Officially released as Colour Sound Oblivion DVD #4. 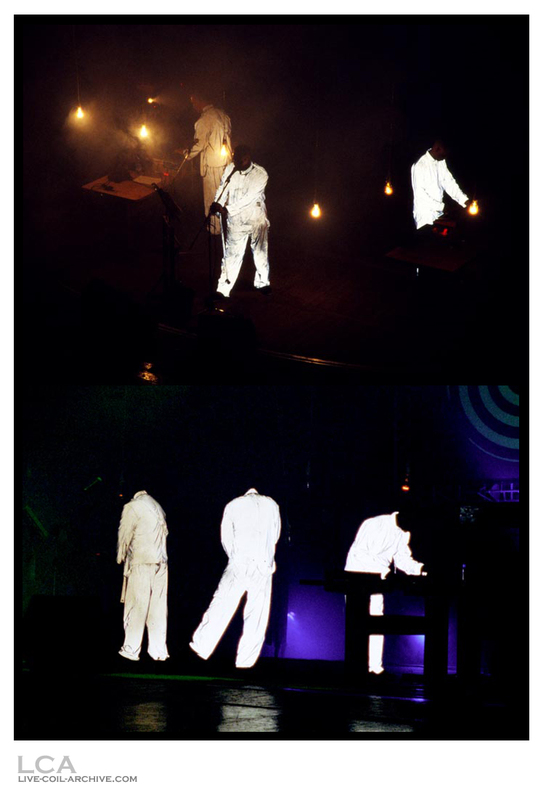 SBD (Live Two) – Recording download link (archive.org). 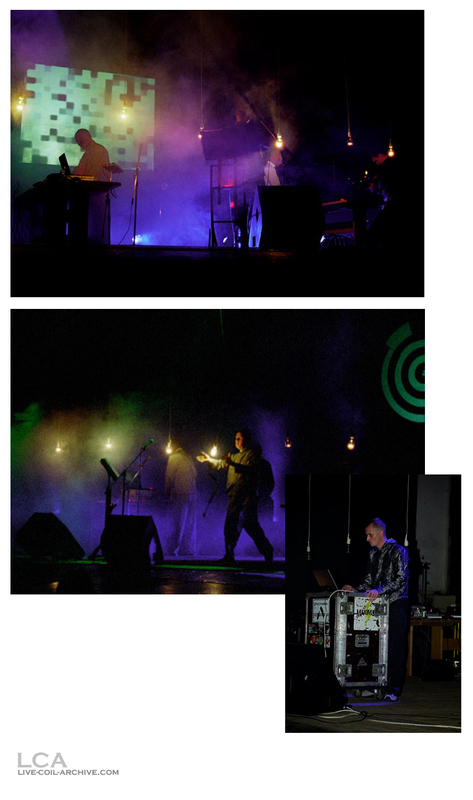 AMT – (Colour Sound Oblivion DVD #4) – Recording download link (archive.org). EDIT #1 – Recording download link (archive.org). EDIT #2 – Recording download link (archive.org). EDIT #3 – (Colour Sound Oblivion DVD #4) – Recording download link (archive.org).